VampChix : Epic fantasy, anyone? Hello fellow readers! This bit of upcoming book info found it's way into my inbox, although I'm not sure that I'll get to read it right away, so I thought I'd share since I'm adding it to my virtual Mt. Everest of books anyway. Fantasy titles are a fairly new genre for me to read because for whatever reason my brain is hardwired to get hung up on all the fictitious names and places, but it's a habit I'm trying to break. This little bit of OCD has caused me to miss out on a number of good books, or so I'm told, and since I have no idea where to start I figured I'd try a completely new series from an author I'm unfamiliar with. Sulis's twin, Kadar, meanwhile, is part of a different sort of revolution. When Kadar falls in love with a woman from a Forsaken caste, he finds he's willing to risk anything to get these people to freedom. But with Sulis drawing a dangerous level of attention from the deities, and war about to break out on two fronts, change may not come as easily as either twin had hoped. 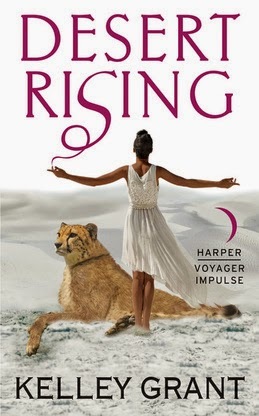 An astonishing debut, Kelley Grant's Desert Rising brings to life a powerful new epic fantasy tale of determination and self-discovery.